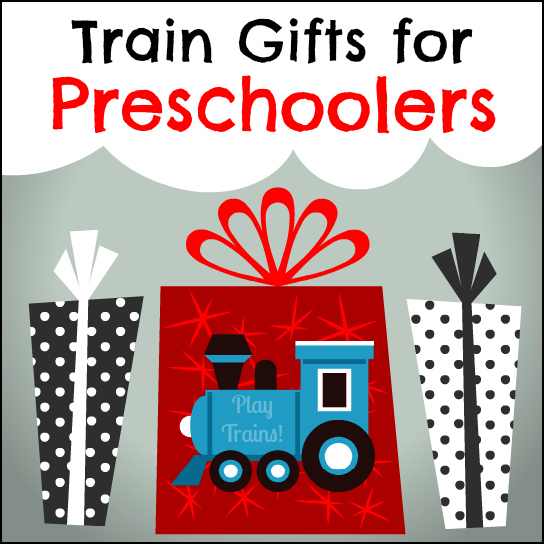 If you’re looking for a gift for a train-loving preschooler, you’re in luck. I’ve searched far and wide for interesting train books, toys, videos, and other gifts to feed my preschool-aged son’s passion for trains, and I’ve found a ton of cool stuff. Buying a first train set? 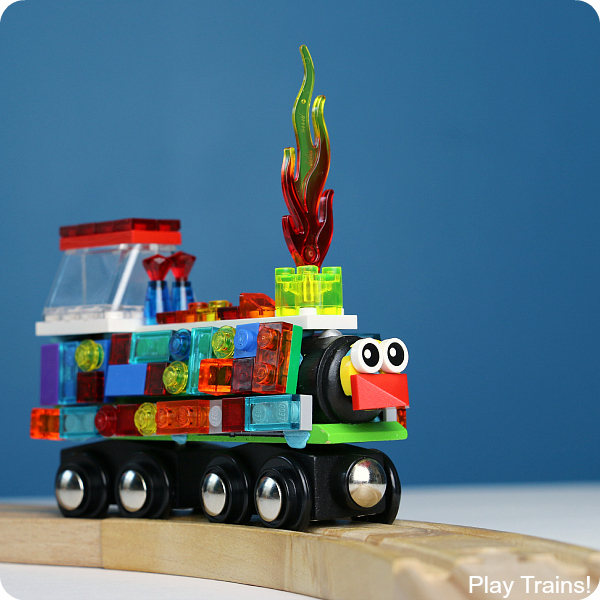 Looking for building toys or craft kits for kids who want to make trains of their own? Trying to find a unique gift for the little engineer who has everything? You’ll find plenty of gift ideas here! This list will be expanded and updated regularly — don’t forget to bookmark or Pin it! Hopefully you’ll find something to delight your young train enthusiast! 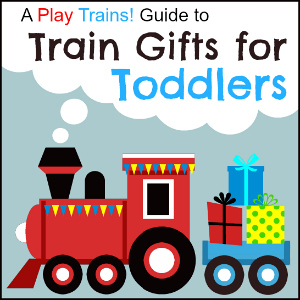 You may also want to check out our Train Gifts for Toddlers guide for more ideas that would be suited to preschoolers as well. 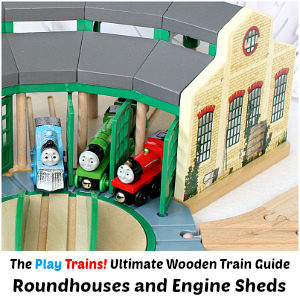 However, I also wanted to give you a best-of-the-best list of outstanding wooden train gifts. Ones that are unique, have that special wow factor, or are just especially fun. You should be able to find something exciting for even the kid who seemed to have every wooden train imaginable. RC Train Engine (BRIO): We just got this for the Little Engineer for his birthday, and we LOVE it. From the controls or using the buttons on the engine, you can make it go forward and backwards, blare the engine’s horn, and turn its lights off and on. It has a nice look and feel to it…very solid, and a joy to run. Our favorite motorized train for wooden tracks yet, though we’ll always love Battery-Operated Thomas and Percy for other reasons. 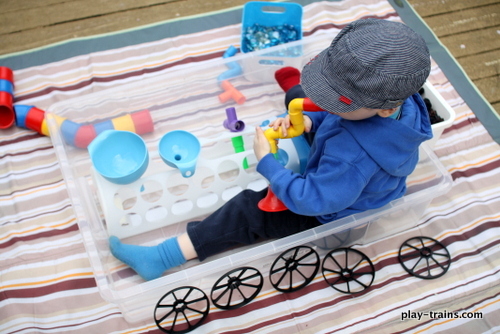 Train Ferry (BRIO): First off — yes, there really are train ferries! Both right now around the world, and way back in the early days of the American railroad, as I recently read in Casey Jones’ biography. This is such a cool addition to a wooden train collection. I think my favorite thing to do with the ferry is to use it to transport trains from a layout at one end of the house to a layout at the other. King of the Railway (Thomas Wooden Railway): The new Thomas movie this year is my favorite one yet, with a much improved script, a new character inspired by real railroad history, and not one, but two new female engines. We like all the new engines, and if you’re looking for a gift for a Thomas fan, they would probably love to get a Stephen, Rusty Stephen, Millie, Connor, or Caitlin of their own. Stephen’s Coaches: I’m going to put this in its own entry, because you could buy these gorgeous coaches for any wooden train set, even a completely Thomas-free one, and they’d be wonderful. Bigjigs Heritage Engines: This is a really gorgeous line of wooden trains designed to look like real, famous engines, perfect for encouraging an interest in railroad history. They also make great substitutes for Thomas & Friends engines, because the Thomas characters were based on many of these trains. Try Bluebell or Kent and East Sussex Pannier for Thomas, Asbestos or the Saddle Engine for Percy, Jack or the Metropolitan for James, Gordon for Gordon, Green Arrow for Henry, the Flying Scotsman for the Flying Scotsman, Kent and East Sussex G.W.R. for Duck, Duchess of Hamilton for Caitlin, the Mallard for Connor, and the Rocket Engine for Stephen…who is actually supposed to be the Rocket. Cargo Warehouse (BRIO): We just gave this to the Little Engineer for his birthday, and it’s really cool. There’s enough room to store eight standard pieces of wooden train freight, two cranes to lift them in and out, a drop-down ramp for the worker figure to load and unload through, and a place to connect a Brio roadway to the back. Knapford Station (Thomas Wooden Railway): Oh, how I longed for this station! I just think it’s beautiful. Oh, and the Little Engineer loves it, too. We have the older version, which had a little building off to the side of the tracks that has been removed, but there are some improvements in this new version and it’s cheaper than ours was. Tidmouth Sheds (Thomas): Our first roundhouse came from an Imaginarium train table set, and it’s served us well for years now. However, we always wanted to have the “real” Tidmouth sheds, because they’re the setting for so many of the scenes in the videos and books. This was a very, very exciting Christmas gift for the Little Engineer. It has the Thomas and Friends style, and a year later it still looks good and works great. 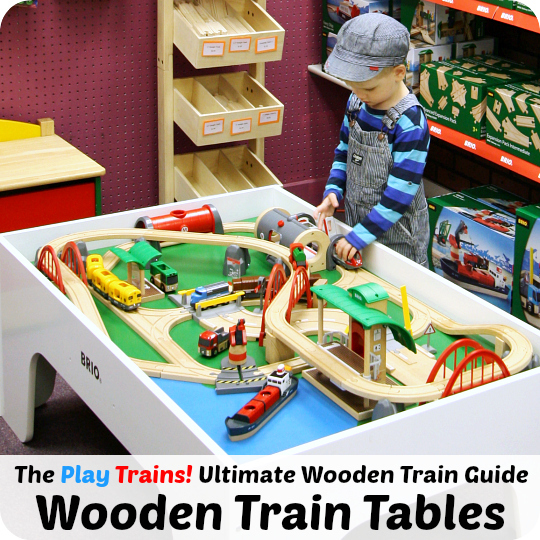 For more battery-operated wooden trains, see the Die-cast Trains, Motorized Trains and Model Trains section below! Adventures of Thomas Set: This is a fun set with three different Thomases, including the Snowplow Thomas you’ll often see on Play Trains! There’s a new version of the set now, and it also has Snowplow Thomas, but with a different facial expression. The Pre-2013 Adventures of Thomas has a smiling Snowplow Thomas, and 2013 Adventures of Thomas has a disgruntled Snowplow Thomas (which is more true to his opinion of snowplows!). You can see our smiling Snowplow Thomas in action with our Christmas Pipe Cleaner Trees or plowing some real snow in Snow Trains: Seven Ways to Play with Snow and Trains. This year, the Christmas trains are Thomas in a Santa’s Little Engine set, and Sidney covered in holiday lights in the Sidney Special set. The stories to go with both engines are featured on the Santa’s Little Engine DVD, which is one of my favorite Thomas DVDs yet. The interludes between the episodes are great. Last year, the Little Engineer got a Holiday Lights Thomas, and it’s really, really cute — better than I expected! LEGO DUPLO My First Train Set: I was very pleased to see a new DUPLO train set released this year, and it looks wonderful. I love the colors and styling of the engine and coaches. LEGO DUPLO Number Train: I included this in our Train Gifts for Toddlers list, but I also think it would be great for a preschooler. It would be fun as a stand alone toy, or as an addition to a larger DUPLO set. This set would provide four wheel bases and a number of train-specific parts, and I can see my son using the numbers on the blocks to inspire storytelling (they could be labels telling the railroad workers where they were meant to be delivered, etc.). LEGO Mini Christmas Train: This looks like a cute little mini Lego train in Christmas colors. 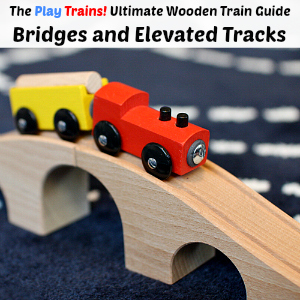 We often mix our wooden trains with our other toys at home, and some of the best ones are construction toys. Often, we build the train out of these toys, too! Here are some that we highly recommend. 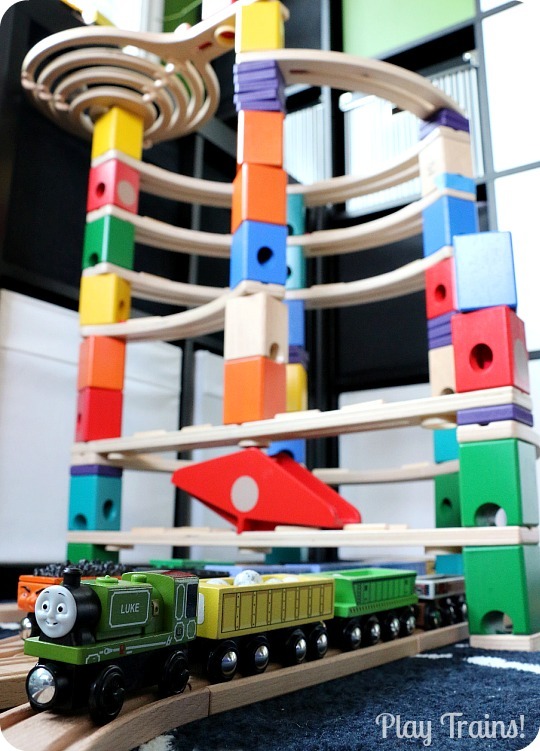 HABA Blocks: Great for building tunnels and buildings, and for supporting elevated tracks (check the Q&A section of our Bridges and Elevated Tracks Guide for tips on how to get the tracks to stay up on top of them). We also have build plenty of “trains” out of them. HABA Technics: When the Little Engineer started really wanting to design his own trains, I was so excited to discover the HABA Technics line of wooden block sets. 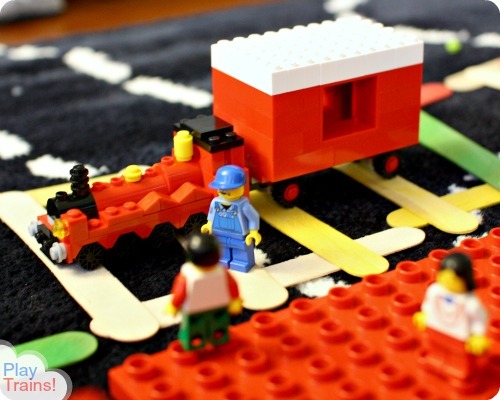 They have plastic connectors that can hold the blocks together, and wheels and couplings to attach to the blocks to turn them into cars or trains! We got the Large Vehicles Set, but you can also try out the Basic Vehicles Pack. Citiblocs: These long, thin rectangular blocks are all precision-cut to the same size and shape, allowing kids (and adults) to build some amazing and creative structures. One of their examples is a steam engine on a trestle bridge. We’re not quite to that level yet, but the Little Engineer showed me that it’s really fun to make train tracks out of the blocks. Quercetti Tubation: This tube-building set is a fun one to have on hand when we want to pretend to fix a steam engine’s pipes while playing Big Engine or with our Coal & Water Steam Engine Sensory Bin. Duplo Tubes Experiment Set: This is a really fun set, especially for a kid who loves marble runs but isn’t quite ready for one. We use these tubes as steam engine pipes and water tower pipes, as you can see with our Coal & Water Steam Engine Sensory Bin (we really found a lot of toys that worked with that one!). Snap Circuits Jr. SC-100 Set: The Little Engineer loves working with this electricity science kit with us. I got it for him when he became more interested in electric trains. I expect to expand our collection of Snap Circuits sets when he’s older, because this is a really cool way to learn about electricity. Thomas & Friends Take-n-Play Trains: These die-cast metal trains are the littlest of the three main lines of Thomas & Friends toy trains. The benefits to this type of Thomas train are their small size and toughness, as well as the portable design of the sets. They also tend to be the cheapest of all the Thomas trains, and often they are very nicely detailed. However, in my opinion, the track can be really hard to work with and keep connected. Unlike Thomas & Friends wooden trains, which are usually cheapest on Amazon, Target and Toys’R’Us tend to have the best deals on Take-n-Play trains, especially if you watch for the frequent sales on them. Target also tends to have special exclusive sets during the holiday season, including a Christmas-themed set. Thomas & Friends Trackmaster Trains: These are the largest of the three lines of Thomas & Friends trains. Made of plastic, these motorized engines are a step closer to model trains in many ways, but big and tough enough for young children to play with. Like the Take-n-Play Trains, the best prices I’ve seen are found are at Target and Toys’R’Us. Toys’R’Us has some exclusive trains and sets, notably an entire snowstorm line with engines wearing snowplows. If you’re looking for King of the Railway Trackmaster trains, you’ll find those at Toys’R’Us as well. Lionel Little Lines Train Playset: My dad had Lionel trains for years, so my parents got this set for the Little Engineer to continue the tradition. It’s fun and interactive, with a crane and cargo loader. They also make a Polar Express Train Set, which is the same set with a different look of train (coaches instead of the freight cars), white tracks, and a backdrop, but without the crane/cargo loader like the one that came with our set. Imaginarium Power Steam Set: This is a cute little set with a red battery-operated steam engine, a black coal tender, a green passenger coach, and a blue caboose. The Little Engineer loves having a blue caboose! Go find this one at Toys’R’Us for a much better price. Battery-Operated Thomas Wooden Railway Engines: The battery-operated engines for the Thomas Wooden Railway line are metal rather than wood. We have Thomas and Percy, and you can also get Hiro, Diesel, James, Salty. You could also get a battery-operated Rosie, though they don’t make her any more. Maybe next year they’ll add a female engine back into their battery-operated line up. Power Trains: Half way between preschool toy trains and model trains, Power Trains are light-weight, battery-operated trains that more closely resemble model trains but apparently hold up to kids playing with them. We only have a few freight cars (they were on clearance, and I knew we’d want to try them out someday), but the reviews for Power Trains generally focus on how much better these toy trains are then the parents expected. The couplings are difficult to work, but that aside, this might be good for an older preschooler who’s itching to get his or her own model train. Model Trains: A very careful older preschooler might be ready to learn to operate a model train with plenty of supervision. At least, I sure hope so, because the little engineer is getting the Bachmann Trains Deluxe Thomas and Friends Special Ready-to-Run HO Train Set for Christmas. There is a super great price on this set on the day I’m posting this! Really, I’m jealous of it, because I paid twice as much. (Note: I read the reviews and the instructions very carefully. Some people have had problems with the set, but ours works fine from my test run, and I know not to run it longer than the maximum time. So hopefully we’ll have no problems.) I also got him a couple of HO Troublesome Trucks to carry freight. I was glad I didn’t wake the Little Engineer up with my giggles delight at Thomas’ moving eyes when I was testing it in the middle of the night! Other model train options for kids include this HO Emily (from Thomas & Friends) set and the various model Hogwarts Express sets for (future) Harry Potter fans, or for non-character sets, you can look at other model train sets and check out any that seem ready to go out of the package, read the reviews, and see what you can find. We love tiny trains at our house! 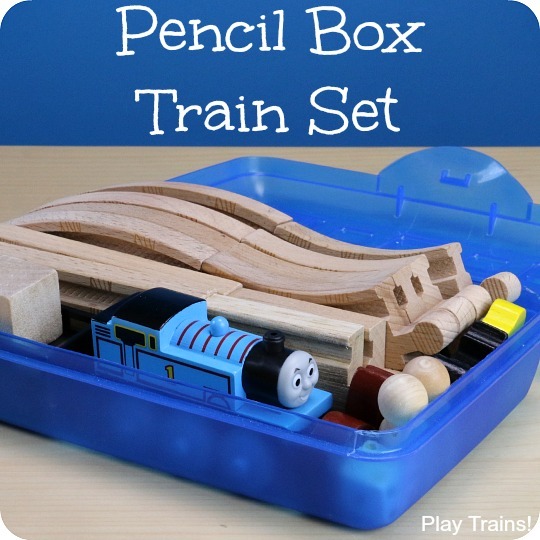 They’re perfect for bringing along on trips or to keep on hand to entertain kids at a restaurant, and you can even make a little set for them like our Portable Pretend Model Train Set, which makes an excellent DIY gift itself. 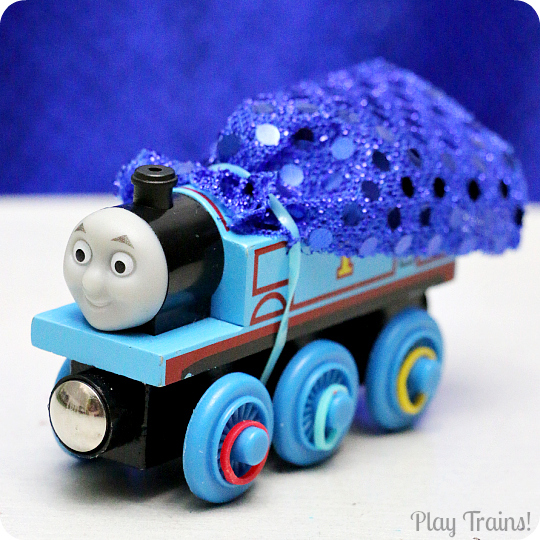 These little trains are also fun to combine with board games (you could even make your own). They would all make great stocking stuffers, advent calendar gifts, or Easter egg fillers. Safari Ltd. 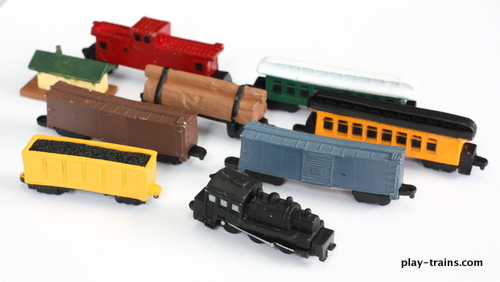 Train Toobs: We love these little plastic trains! The Safari Ltd. Trains Toob comes with a diesel engine and more modern freight cars. You can see it in action in that Portable Pretend Model Train Set I mentioned. The Safari Ltd. Steam Train Toob comes with a steam engine and somewhat more old fashioned freight cars. We once froze them in ice for a fun science activity. Thomas & Friends Pez Trains: These “Pez Trains”, as we call them, are our favorites in our tiny engine collection. They’re the broken-off tops of Thomas & Friends Pez dispensers. I’ve seen them available individually at Toys’R’Us and one of the chain party stores. For such small toys, they have enough detail and personality to look really great. For added fun, give these along with Hexbug Nanos (this is the pack we got, with enough for all four Pez engines) and follow the instructions in this video to make your Pez trains go! My Busy Books: Thomas & Friends: This cute set of Thomas & Friends trains comes in a book with a play mat. They aren’t quite as nice as the Pez engines, but there’s more variety, and they’re even smaller which can be nice. They go especially well with the Train Toobs I talked about above. Note: they seem to be sold out for the moment (or for good?) at Amazon, but I’ve seen them recently at Target for the price I paid for ours. Thomas & Friends Rev-n-Go Engines: These are getting harder to find, but there are still a few listed on Amazon, and they’re so adorable they’re worth tracking down once those disappear. Thomas, James, and Percy are so little and cute, so nicely detailed, plus they zoom across the room if you pull them back and let them go! They also made a Rev & Go Round the Island Playset that’s a lot of fun, and perfect for taking along on trips or around town. Thomas & Friends Pull Back Racers: We don’t have these, but they get good reviews and I love the variety of engines that comes in the set. Maple Landmark Made By Me Trains: These are very nice wooden trains that your child can glue together and then paint. They are sturdy enough to play with. You can see the ones we made in Assembling and Painting Wooden Trains with My Toddler. 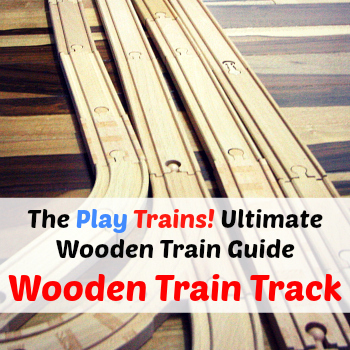 Creativity for Kids Wooden Train Kit: This is another wooden train kit we’ve made. It turned out very cute, but because of the not-quite-round wheels and the thin axles, it’s more for decoration than for play. Thomas’ Sticker Express: This is an awesome sticker book! There are so many stickers, with lots and lots of different engines. Plus, at the end, there are track and scenery stickers to make your own railway! Train Chocolate Mold: We just got this in the mail, and while the mold is maybe a little rough to make nice chocolates, I’m hoping it will be great for making train crafts with play dough or clay. 4-Tone Wooden Train Whistle: This is one of the wooden train whistles we have at home. 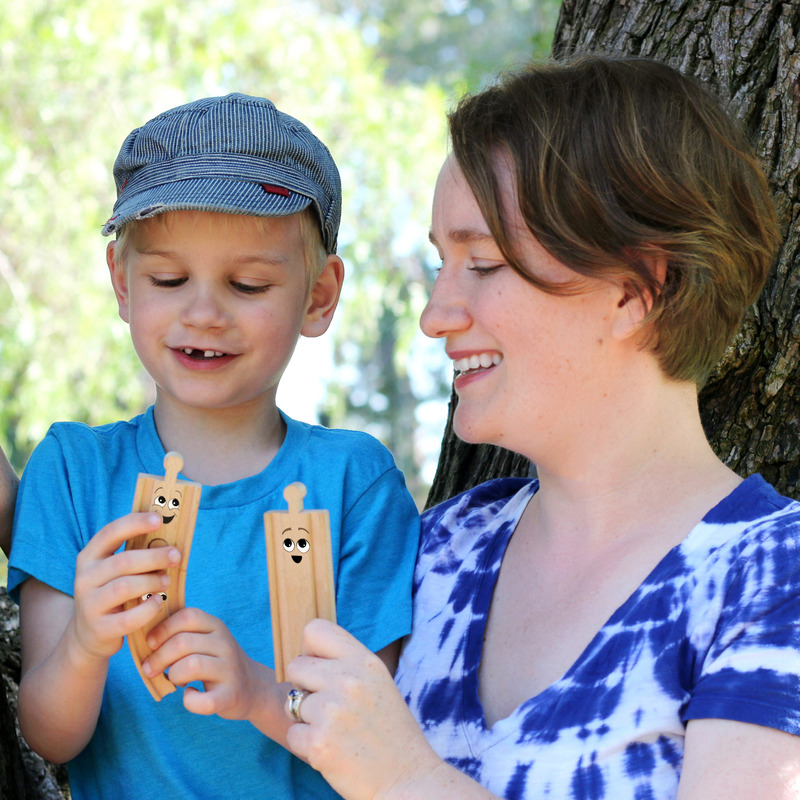 Thomas Wooden Train Whistle: And here’s a wooden train whistle for the really dedicated Thomas fan. Hohner Train Whistle: This one is waiting to go into the Little Engineer’s stocking this year. I tested it out, and it sounds really great! Ride Along With Thomas Steering Wheel Sound Book: This is a fun and interactive book to read with kids, but what we love to use it for is a train sound board, either when playing Big Engine or to make sounds for our wooden trains. James Coffey CDs: My Mama was a Train, I Love Toy Trains: The Music! Oshkosh Hickory Stripe Clothing: Oshkosh is generally our choice for engineer-striped clothing. The overalls are well made, and they have styles for both boys and girls. Oshkosh also makes adorable Hickory Bears in dark blue and blue-and-white-striped denim. Choo Train Pajamas Set: This set comes with a pajama shirt, pants, and a robe, and it’s really cute. I think I’m about to go order it for Christmas morning for the Little Engineer. Hatley Train Pajama Set: Another cute train pajama set. Engineer’s Hat: The Little Engineer’s hat is sadly no longer available, and I’ve had a hard time finding another real hat meant for everyday wear to recommend. However, this engineer’s hat gets good reviews on Amazon, so that’s a good place to start until I track down something really good. Read the reviews for a good tip about how to make it stand up properly passed on by a real train engineer. Train and Car Ice Cream Sandwich Molds: Now, doesn’t that sound fun? Thomas the Tank Engine Spoon and Fork Set: We have this, and it’s a nice little set that the Little Engineer is always pleased to see show up on the table. Thomas & Friends Chopsticks: I kid you not…they really make these! We have enjoyed many wonderful meals out at our favorite sushi restaurant thanks to these cute little training chopsticks. (Thank goodness “Sushi Guy” as the Little Engineer calls him kindly saves them for us when we forget them at the restaurant!) You can get Thomas, Percy, or James chopsticks. There are so many wonderful train books that it would take me several posts to tell you about all of them! For now, here are some very special ones which you may not have heard of. Peter’s Railway: I cannot recommend these books enough! 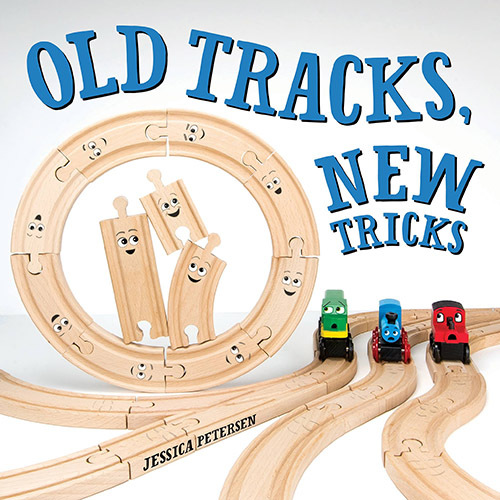 For school-aged children and preschoolers ready to listen to a gentle chapter book about one of their favorite subjects, the hardcover series of Peter’s Railway books is so wonderful, allowing the child to imagine building and improving a railway and running a miniature steam engine with a beloved grandfather while learning loads of technical details about railways, trains, and other feats of engineering. We have read our copies several times through, back-to-back. The short paperback books that the author has written to go along with the original series are great, too, and some of them are appropriate for children who are too young for the chapter books. Visit the Peter’s Railway site or read our detailed review and activity ideas to learn more! How to Train a Train: This title, new in 2013, is a very cute book along the lines of other picture book “guides” to choosing and taking care of unusual “pets”. Maybe we’re biased toward the trains, but we think this is the best in that genre that we’ve read! It’s very funny, and best of all, there are girls pictured with the trains in some of the illustrations! Thomas the Tank Engine collection: You’ve probably heard of the original Thomas stories called the Railway Series, written by the Rev. W. Awdry, but you may not know that you have a few options when it comes to the format you buy them in. The current edition of the collection is a very nice book with a couple of issues: 1) it doesn’t include all of the stories and 2) it has been Americanize (“Sir Topham Hatt” instead of “the Fat Controller”, “freight cars” instead of “trucks”, and so on). If you would like the full series of Awdry’s stories without the unnecessary Americanization, you need to go back and get (most likely a used copy of) Thomas the Tank Engine: the Complete Collection. Or, for a truly gorgeous and impressive gift, you could opt for Thomas’ Engine Shed: The Classic Library, a beautiful boxed set of the 26 original Railway Series books. The Little Red Train series: Here’s a great series of books from the UK about Duffy Driver and the Little Red Train. I love the detailed pictures in these books, and the rhythmic prose. There are quite a few of them, and they’re worth ordering used if that’s the only way to get them. Ivor the Engine: An Irish friend of ours told me about this one, and I’m so grateful he did! Ivor the Engine was a British cartoon show about a little steam engine (almost exactly the same model as the one Luke from Blue Mountain Mystery was based on). You can watch the episodes on YouTube. They’re wonderful, but even more, we like reading the books that were written to go with the series, especially Ivor the Engine: The First Story and Ivor the Engine: Snowdrifts. If you watch the video version of the stories first, it can be fun to try to emulate the rhythm and tone of the narrator’s soothing voice while reading the story. Train Christmas Books: You’ll find a list of some of our favorite Christmas train books at the end of our White Christmas Train Layout post! The Choo Choo Bob Show: I love this live-action children’s show so very, very much! This is perfect for kids who are starting to move away from the preschool train characters / shows and want to learn more about real trains. But it’s also just a fun show that everyone in the family can enjoy. Read more about the show and the picture book that goes with it. King of the Railway: This is the newest Thomas & Friends movie, and a great favorite of ours! If a child in your life loves trains, I highly recommend that you sign up for our email newsletter! 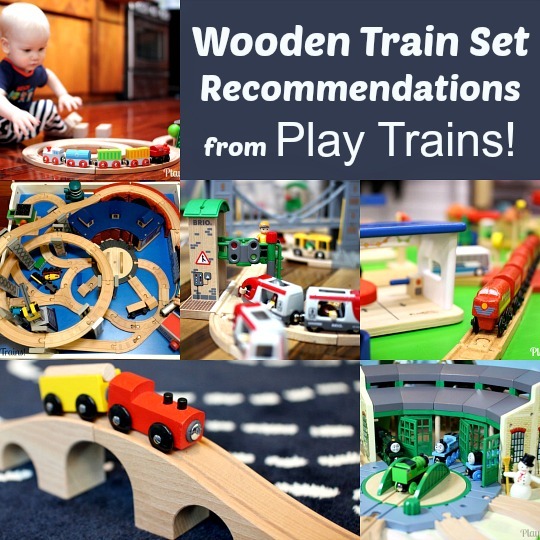 We share all kinds of ideas for playing and learning with kids who love trains here on Play Trains!, and email is the best way to be sure to hear about all of them. thank you so much for putting this together. We went “shopping” last night and got some of your suggestions. Very helpful!!!!! You’re very welcome! I’m so glad to hear it helped you out! You are doing an amazing job! Thank you so much for all your tips, recommendations, reviews, suggestions.